طبق تعریف کمیته فنی شماره 207 انجمن بتـن آمریکا (ACI)بتـن غلتـکی یا RCC نوعی بتـن با اسلامپ صفر می باشد که عملیات حمل، پخش و تراکم آن با استفاده از ماشین آلات عملیات خاکی صورت می پذیرد. بتن غلتکی مخلوطی از سیمان، مصالح سنگی و آب است که برای ساخت پروژه های راهسازی، سدها، بازسازی سدها و ایجاد فرازبندها و بعضی نیازهای دیگر به کار برده می شود. این نوع بتن به منظور ایجاد تراکم مناسب، بایستی وزن ماشین آلات متراکم کننده را تحمل نموده و در خمیر آن برای پوشانیدن کلیه سنگدانه‌ها رطوبت کافی موجود باشد. با توجه به مصرف فزاینده و اقبال روز افزون به سازه های بتنی به ویژه بتن غلتکی استفاده از پوزولان‌ها و جایگزین کردن آنها با سیمان اهمیت بسزایی می‌یابد. امروزه استفاده از مواد افزودنی جایگزین سیمـان با توجه به مزایای فنی (کاهش حرارت هیدراتاسیون) و مزایای اقتصادی، جایگاه ویژه ای در طرح اختلاط بتـنهای غلتـکی دارد و به ویژه به دلیل فراوانی منابع معدنی پوزولان در ایران، استفاده از آنها امری منطقی و اقتصادی است. در این تحقیق سعی شده است تا با استفاده از توف سبز شاهین‌دژ که از پوزولانهای در دسترس در استان آذربایجان غربی می‌باشد، خواص بتن تولیدی مورد آزمایش قرار گرفته و تاثیر این نوع پوزولان بر روی مقاومت فشاری، مقاومت کششی و نفوذپذیری بتن غلتکی نیز بررسی گردد. Due to the growing popularity of concrete structure and increasing use of them, especially Roller compacted concrete, applying Pozzolan and replacing cement with Pozzolan is very important. 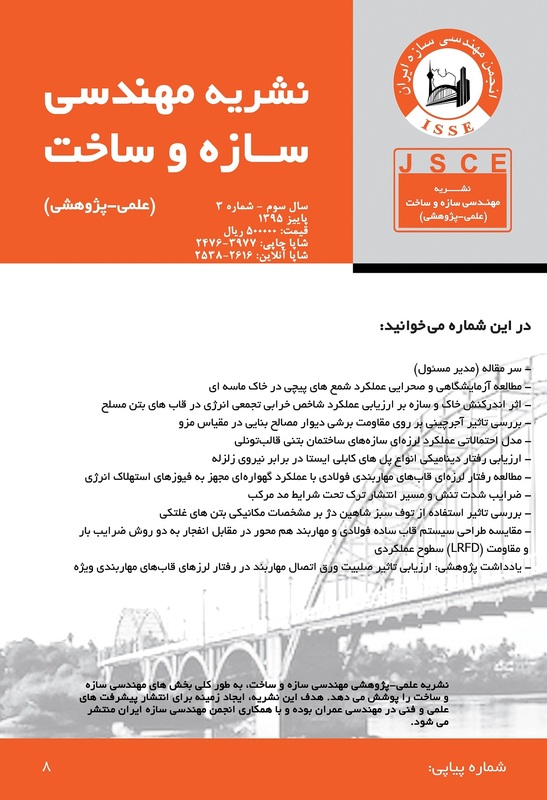 Nowadays, the use of the additive for cement replacement is common in RCC mix design due to its technical advantages and economic benefits as there is large quantity of Pozzolan mineral resources in Iran. In this paper the impact of produced concrete has been fully considered as well as the effect of this Pozzolan on the compressive strength, tensile strength and permeability by using green Tuff obtained from available Pozzolan in western Azarbaijan. The due results prove that Shahin-Dezh green Tuff improves concretes quality. Dussart, J. et al. (1998). Roller compacted concrete for the petit South dam. Travaux Magazine, No.688, 14-21. Nagayama, I., Jikan, S. (2003). 30 Years History of Roller Compacted Concrete Dams in Japan. Proceedings of 4th International Symposium on Roller Compacted Concrete. Madrid, pp. 27–38. Schrader. E. k. (1994). Roller Compacted Concrete Dams-Properties and Cracking Myths, Misconceptions, New and Controversial Issue, International Scientific Workshop on Roller Compacted Concrete Dams. University of Laval. داسمه اردشیر . (1378) عوامل موثر بر فرصت کاری بتن غلتکی . پایان نامه کارشناسی ارشد ، دانشکده فنی ، دانشگاه تهران. American Concrete Institute. (1999). Roller Compacted Mass Concrete, ACI 07.5R.99. ASTM C33M-16e1. (2016). Standard Specification for Concrete Aggregates. ASTM International, West Conshohocken. ASTM D4791-10. (2010). Standard Test Method for Flat Particles, Elongated Particles, or Flat and Elongated Particles in Coarse Aggregate, ASTM International, West Conshohocken. ASTM C150M-16e1. (2016). Standard Specification for Portland Cement. ASTM International, West Conshohocken, PA.
 ASTM C1017M-13e1 (2013). Standard Specification for Chemical Admixtures for Use in Producing Flowing Concrete. ASTM International. West Conshohocken, PA.
 ASTM C494M-16. (2016). Standard Specification for Chemical Admixtures for Concrete. ASTM International, West Conshohocken, PA.
 American Concrete Institute. (2002). Guide for Selecting Properties for No Slump Concrete. ACI 211.3 R-02.